My greatest accomplishment as a Southern Culture Ambassador has been converting Seattleites into piggie lovers. 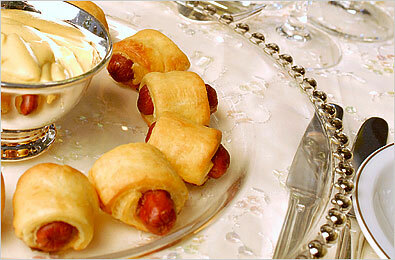 It was with great trepidation that I first showed up at my book/brunch club with a tray of piping hot piggies. I thought surely my sophisticated, erudite friends would scoff at the prospect of eating lil smokies and American cheese wrapped in store-bought, fresh-from-the-can crescent rolls. Lo and behold, not only did they not scoff; they scarfed. I might’ve even come home with an empty tray (and by “tray” I mean giant faux Tupperware container). I can’t remember, seeing as I was so stunned. I don’t make piggies all that often due to my aversion to coming in contact with what can only be described as (squeamish folks might want to skip ahead) lil smokies juice. But when I do show up with a container of piggie deliciousness, I step aside quickly lest I be pounced upon like Pepé Le Pew’s long-suffering, would-be lady friend. So what do piggies taste like? Well, folks, they taste like hugging seldom-seen but always-cherished old friends. Like recalling collective memories that lead to hysterical laughter. Like dancing to “I Will Survive.” Like carefree college days. Like nostalgia. Like home. Also, meat, cheese, and bread – three of my favorite food groups. My sister is the designated piggie maker at our annual Christmas party. I think she does it partly for the powerful admiration piggie making elicits. Mostly, I think she fears that if she didn’t make them, we might go piggie-less. The horror!! I must confess that her self-appointed position of Piggie Maker in Chief has led to fights on more than one occasion – almost always in the refrigerated section at Kroger. But then, if you can’t make a scene in public, what’s the point of fighting? Jenna (playing me): Jenna! WHY are you buying so many crescent rolls? 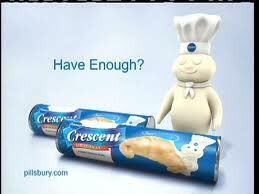 You don’t NEED that many crescent rolls!! Me (playing Jenna): If I don’t buy eight thousand cans of crescent rolls, people will STARVE TO DEATH! Jenna (playing me): Just get three cans! You don’t NEED more than three! Me (playing Jenna): I’m getting four! I ALWAYS get four! Jenna (playing me): WHAT-EVER! Get what you want. FINE. I don’t care. FINE!! WHAT-EVER!!! Pause to represent the deafening silence that is our ride home from the grocery store, which will be followed by a private cooling off period/sulking time. I’m delighted to report that it worked. We managed to go a whole visit without fighting once. We’d almost done that one time before, except that an observation that we hadn’t had a fight led to a heated argument. About what, I cannot recall. A couple of weeks ago, I was at a going-away party for two of my favorite people in Seattle who are now two of my favorite people in Boston (despite the fact that they up and left me for better jobs. The nerve!). Our host Jenny, who’s always generous with comfort food and hospitality had put out quite a spread, the star of which was a tray of piggies! (And by “tray” I mean cute serving dish.) I quickly popped one into my mouth and two thoughts immediately sprang to mind: 1. That’s one dee-li-ci-ous piggie! And 2. There are five left. How many can I get away with eating? A quick glance into the kitchen assured me that more were on the way. Yippie! So long, lil smokies. Nice knowing you. I’ve often toyed with the notion of making a fancy version of piggies, but can’t break from the “don’t fix what ain’t broke” school of thought. When I tasted Jenny’s piggies, I prepared myself for a paradigm shift. There’s no way that was a cresent roll from the plastic-wrapped-cookie-dough-and-canned-items-claiming-to-be-biscuits section of Kroger. But they WERE! However, the lil smokies had been replaced by lil smokie-sized chicken and apple sausages. Yum! Also, they were cheese-less, which is usually a deal breaker for me, but I have to admit I didn’t miss it. I know! Shocker! ← 86. Toothless Joe, Darlene Sardine and other Nicknames. Oh my! A friend of mine made these for my Christmas Party last year…..soooooooo delicious! hope your friend makes them next year! for me, it wouldn’t be christmas without piggies. YUM. This post makes me think of EVERY GATHERING I ever attended growing up. The party was a success if there were plenty of piggies to munch on. I have to admit, I took piggies for granted till I moved away from MS. First gathering in California, no piggies. Ok, maybe somebody forgot. Second, no piggies – hmm…am I seeing a pattern? Third, no piggies. ACK! Where are the piggies?? What’s wrong with you people?? Piggie deliciousness? 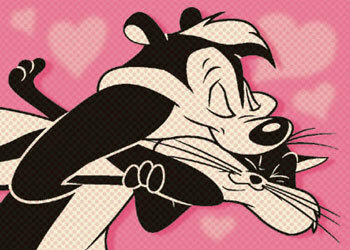 Pepe Le pew’s long-suffering, would-be lady friend? Where do you come up with hilarious stuff? And I loved the Pepe illustration!